Wachau is the valley of the Danube between Melk and Krems. It is located 80 kilometers west of Vienna and is listed with UNESCO World Cultural and Natural Heritage Sites. The long history of the area is also shown by the spectacular monasteries Melk and Göttweig, as well as the old town of Krems. 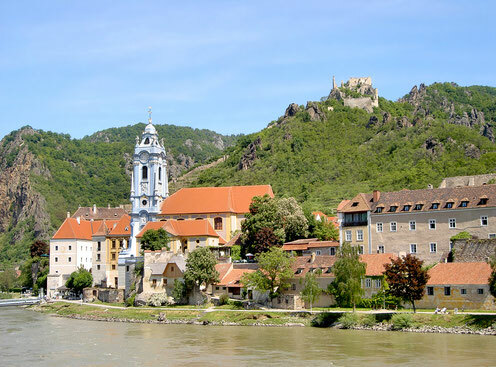 And not to forget, Wachau is known for its excellent wines, which are produced here since the roman times. The world-famous monastery Melk is an icon of baroque architecture throughout Europe. Visitors await excitingly designed museum rooms, which present the history and present of the monastery. Monks are still living there today. Wachauer Marille (apricot) is very popular in the area of the Wachau, growing without chemical pesticides, which gives them a unique taste. Besides eating Marille, a tasty schnapps is made from them. Wachau wine is so special, it has its own specification for the highest quality wine – called Smaragd. The name comes from the smaragd lizard which can be found in the Wachau vineyards, when enjoying the sun. If you like to enjoy nature on the bicycle, this is the place to go! The Danube Cycle Path leads you through fantastic greenery on a wonderful path along the Danube. Perfect for a casual cycling tour but interesting for experienced cyclists, too!